In honor of my first day back in Puerto Vallarta (for my FOURTH annual writing retreat), I am posting this short piece. Thanks to Juan Carlos for the inspiration. “I need to practice my Spanish,” I tell Juan Carlos. His chocolate colored chihuahua, Dario, is off leash, walking in front of us on the jagged sidewalk. 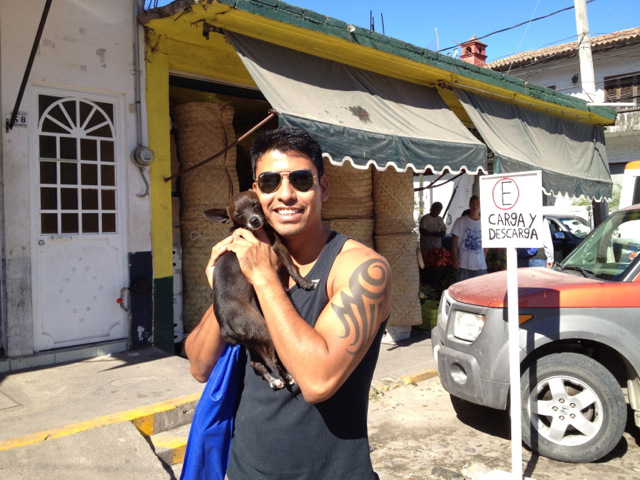 As we approach the open market, Juan Carlos scoops him up effortlessly and holds him with one hand. Juan Carlos’ hair is a glossy black in the warm sun. Mangoes are spilling out of a wooden crate, and Dario’s nose is actively sniffing the air. 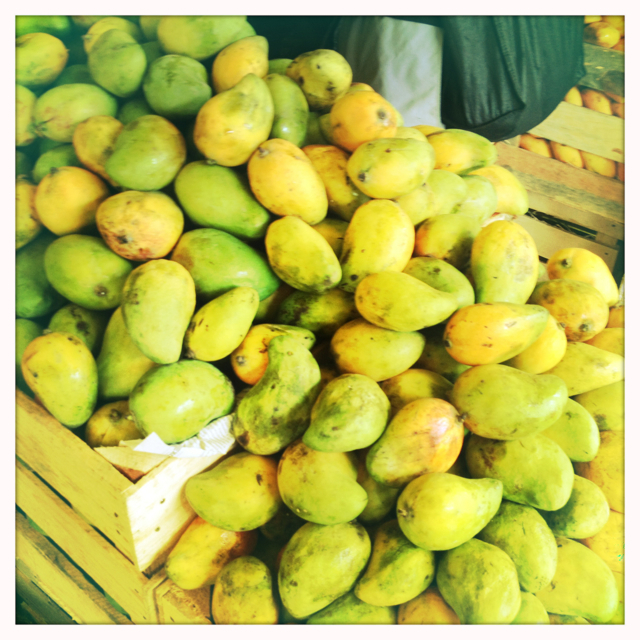 We discuss dinner that night, and though we don’t have a plan for the mangoes, we decide we can’t pass them up. “Where are the tortillas?” I ask. “Oh, really?” he says, slipping into English. It’s his expression. Whenever he says it, I feel the urge to kiss him, but of course I don’t. “How do you say that in Spanish?” I ask. He thinks about it. “En serio? It doesn’t exactly translate,” he says in English. I’m not totally lost in a fantasy. I know Juan Carlos is someone else’s boyfriend, I know I don’t live here, and I know I’m not bilingual. But for a moment I allow myself to imagine what it would be like to live here for awhile, and shop for dinner every night with my handsome boyfriend at the corner of Naránjo and Lázaro Cardénas. As if Dario can read my thoughts, we make eye contact, and his little whip of a tail starts fluttering with happiness. I lean in for a tiny pink-tongued kiss. Dario’s breath is terrible, but I accept his kisses, grateful for the affection. Juan Carlos is gentle with me. Easy. After we pay for the groceries, he takes the heavier bag, hands the lighter one to me. I can smell the fresh tortillas as we walk languidly across the cobblestone street. The air is warm. My joints are loose and relaxed. The sing-song of Spanish floats around me like a sinsemilla haze. Juan Carlos’ eyes are so dark I can’t see his pupils, but when he looks at me and smiles, they flash a silvery light. I smile back at him. Beautiful, I think in English, and then catch myself. Muy Bonito. I’m in a foreign place, but it somehow feels like home.